BYOD is making significant inroads in the business world, with about 75% of employees in high growth markets such as Brazil and Russia and 44% in developed markets already using their own technology at work.In most cases, businesses simply can't block the trend. Some believe that BYOD may help employees be more productive. Others say it increases employee morale and convenience by using their own devices and makes the company look like a flexible and attractive employer. BYOD security relates strongly to the End node problem, wherein a device is used to access both sensitive and risky networks/services. 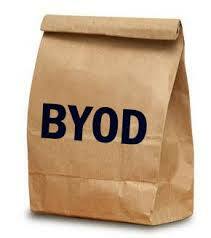 BYOD has resulted in data breaches. For example, if an employee uses a smartphone to access the company network and then loses that phone, untrusted parties could retrieve any unsecured data on the phone. Another type of security breach occurs when an employee leaves the company, they do not have to give back the device, so company applications and other data may still be present on their device. A key issue of BYOD which is often overlooked is BYOD's phone number problem, which raises the question of the ownership of the phone number. The issue becomes apparent when employees in sales or other customer-facing roles leave the company and take their phone number with them. Customers calling the number will then potentially be calling competitors which can lead to loss of business for BYOD enterprises. International research reveals that only 20% of employees have signed a BYOD policy. If sensitive, classified, or criminal data lands on a US government employee's device, the device is subject to confiscation. Businesses that embrace BYOD have some advantages over competitors. For starters, BYOD programs generally shift costs to the user. With the worker paying for most, or all of the costs for the hardware, voice or data services, and other associated expenses, companies save a lot of money -- as much as $80 per month per user. That brings us to the second significant benefit: worker satisfaction. Users have the laptops and smartphones they have for a reason -– those are the devices they prefer, and they like them so much they invested their hard-earned money in them. Of course they’d rather use the devices they love rather than being stuck with laptops and mobile devices that are selected and issued by the IT department. But then there are Concerns around it as well since by embracing BYOD, organizations lose much of the control over the IT hardware and how it is used. Company-issued IT typically comes with an acceptable use policy, and it is protected by company-issued security that is managed and updated by the IT department. It is a little bit trickier telling an employee what is or is not, an “acceptable use” of their own laptop or smartphone. There are many solution providers like CISCO, CITRIX, IBM which offers suites that supports visualizations and helps over coming the security and data ownership issues. And even after purchaser the licenses of these products BYOD does turn out to be cheaper and one can surely go for it post taking the precautions.